The VS-62H is a high-quality, 6x2 matrix switcher for 4K UHD HDMI signals. It reclocks and equalizes the signals and can route any input to either or both outputs simultaneously. It supports resolutions up to 4K@60Hz (4:2:0) UHD and WUXGA. Kramer reKlocking & Equalization Technology - Rebuilds the digital signal to travel longer distances. HDMI Support - 3D, Deep Color, x.v.Color, Lip Sync , ARC, HEAC pass-through, Dolby TrueHD, Dolby Digital Plus, DTS-HD, and 7.1 multi-channel audio. 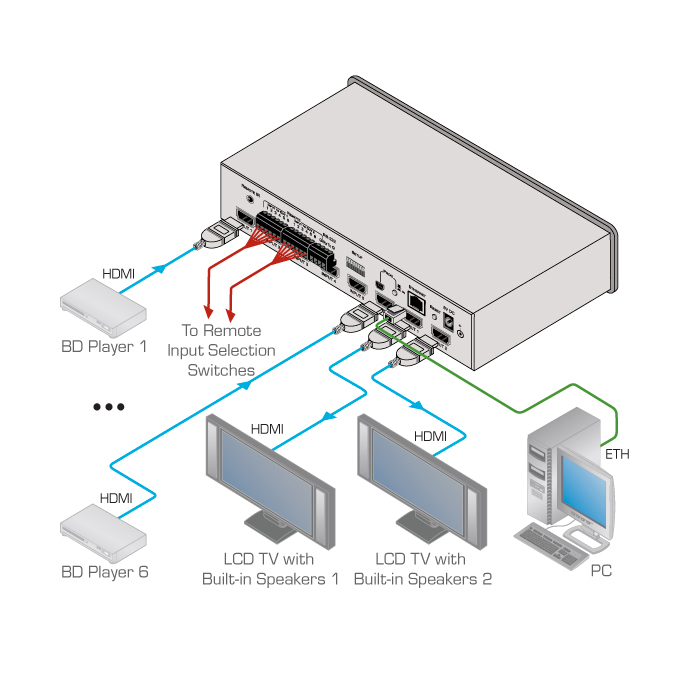 Programmable Step-In Functionality - When used in conjunction with compatible step-in devices, such as the SID-X3N (using an HDMI cable that supports HEC, the HDMI Ethernet Channel). Auto Switching Option - For either or both outputs, last-connected or priority switching. Lock Button - Prevents unwanted tampering with the front panel. Flexible Control Options - Front panel buttons, IR remote (included), optional external remote IR receiver, RS-232, Ethernet, contact closure, embedded Web server. Embedded Web Pages - Provide remote configuration and operation. Static or Dynamic DHCP IP Addressing.